Born in Conegliano (Treviso) on August 30, 1968. Degree in Law at the University of Bologna (1995). Member of the Treviso Bar Association since 2002 and in the Register of Lawyers in Cassation since 2016. 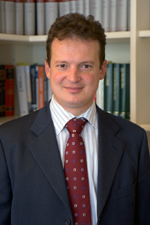 Since 1995 he has been working at the Law Firm Gardenal & Associati, of which he has been associated since 2002. He is a speaker in seminars and training courses organized by various institutions and institutions (for example: Course “From idea to business”, organized by Treviso Tecnologia, special company of the Chamber of Commerce of Treviso for technological innovation, on the topic “Legal corporate forms and social structure – Advantages and disadvantages of the various corporate legal forms”, “International contracts with focus on e-commerce and telematic contracts”, at the Belluno Chamber of Commerce, “E-commerce and telematic contracts: legal profiles “At the Chamber of Commerce of Treviso). He has participated in several in-depth courses on corporate and industrial law (trademarks, patents, design, in relation to the Code on industrial property and the Enforcement Directive, organized by Altalex Formazione in 2009, the construction of the budget, organized by Ipsoa training in 2010, the budget for lawyers, organized by AIGA of Padua in 2011, patents for invention in the new industrial law, organized by Unindustria Treviso in 2012, the protection of confidential company information, organized by the Treviso Chamber of Commerce in 2013, meetings of in-depth study of the law of limited liability companies, organized by the Treviso Accountants Association in 2013, E-Commerce, consumer rights and distance contracts, organized by the Trevigiana Civil Chamber in 2014); Regulation of the European Union privacy, organized by National Lawyers Association in 2018. Commercial law, company law, commercial trial law, telematic contracts law (E-commerce), national and international private and procedural law.